Modern kitchen design is more than style and using the latest appliances. The first thing you need to consider are the ergonomics of daily tasks that impact the function of your kitchen. Modern doesn't mean contemporary. Victorian, Italian Renaissance, or Traditional styles were contemporary to their time periods. Contemporary styles can be designed as modern kitchens. 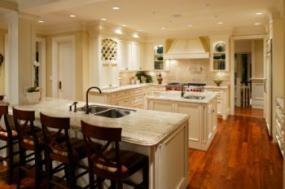 A modern kitchen utilizes the most up-to-date appliances, cabinetry designs and conveniences. The design doesn't compromise the style, but marries the two so there is complete harmony. What Is the Definition of Modern Design? The standard triangle layout is created by drawing lines between the sink, refrigerator and cooktop. This layout may not be the best approach since more families are preparing meals together and this layout caters to a traditional, one-cook kitchen. Before building or renovating your kitchen, you should conduct a workflow analysis. This analysis will help you understand all of the functions performed in your kitchen. You'll then use these results to layout the space to accommodate those tasks with ease and convenience. This design approach will give you a customized workflow that fits your families' needs. What activities will be taking place in your kitchen and who will be performing them? Do you need different areas for various tasks? What tasks are repetitive and which ones are performed occasionally? Do any areas require a different counter height to comfortably perform the tasks? Some food preparations are repetitive and are better served with higher counters while others need regular height. Do you need seating for small children at the kitchen counter or will adult height be sufficient? Do you grow your own vegetables and need a farm sink for washing fresh produce from the garden? Do you entertain and need a second sink for faster clean up? Do you need an entertaining sink for ice and bottles? Once you answer these and any other questions you have, you'll have a better idea where to locate the appliances and workstations. Which colors are best for resale value? Which appliances are the most desired by home buyers? What type of countertop material is the most popular? Are wood floors preferred over tile floors? Keep your selections within a moderate range of the average choices and you'll have a kitchen that future home buyers will want. Eco-friendly is an important element to home owners. Sustainable and reusable should be design considerations for increasing market values. Cork - Same trees still producing after 100 years. While there are certain industry standards for a modern kitchen that include shelving heights, countertop heights, layout, and appliances don't be afraid to change things to suit your family. 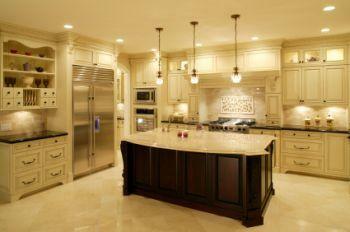 Refrigerator - Paneled refrigerator doors to match your cabinets is a personal choice. Venting hood or range venting system - The most popular ventilation system is the range hood. Oven - Convection and traditional oven combination. Two ovens are often seen in a modern kitchen, especially if you have a large family or do a lot of entertaining in your home. Gas Range - Easier to cook on since temperature is better controlled than electric ranges. Mixer and Blender - Opt to spend a little more for a stowaway cabinet where the blender and mixer can be lifted to countertop height while never leaving the shelf. Vertical drawer storage for pots and pans is a great design element and gives easy access. (Lazy Susan, swing corner cabinets, roll out shelves, and storage bins help organize and minimize body strain while making for a pleasant daily cooking experience. Spice drawers should be located near the cooking station. One of the newest and most exciting kitchen design trends is the double island. This is a functional and attractive addition to the modern kitchen. One island serves prep, storage and cleanup tasks while the second one is the main workstation where the dishwasher, sink and cooktop are located. Having a second island frees up wallspace for additional appliances and features. Whatever you decide to add to your modern kitchen design, remain focused on the goal to create a warm and inviting place for you and your family to enjoy.